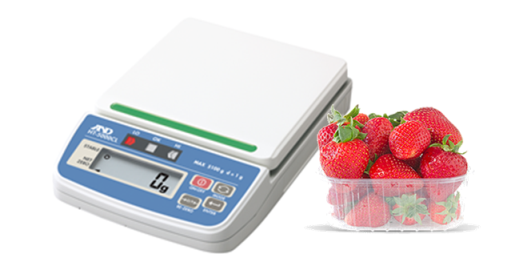 Weighing is one of the most fundamental metrics at the core of manufacturing processes; particularly in the packaged food and fresh produce sectors. An emerging trend during the current SE Queensland Strawberry season that shows how looking at weights in a different light (or lights in this case) can improve product yields with some staggering results. Other fresh produce sectors and manual packing operations can apply the same improvement for potentially massive gains. With escalating costs, and downward pressure on product prices, it’s vital to seek simple ways to increase productivity. In the fresh fruit & vegetable sector, many companies rely on manual packing processes, often utilising casual labour to pack into punnets/boxes/bags ready for supermarket consumers. Labour is typically the biggest cost to a business, but there is another that can go unmeasured – the cost of extra produce given away in overfilled packs. This can add up to thousands of dollars per week and some local packing sheds are reducing this “giveaway” with one simple change – utilising traffic light signals on their packing scales rather than staff focussing on the numeric weight display. This simple idea has two immediate benefits… Reducing overfilled packs and increasing packer speeds. People respond to signals with far less thought process than looking at numbers. Green means “GO”, Red means “STOP” – it’s part of everyday life, transcending language& cultural communication barriers. By utilising packing scales that have a target-based signal system, packing staff & management alike enjoy immediate benefits; stringent fill targets can be set for both upper & lower weight bands. Packing staff are able to quickly fill & check that products are correct, and the increased visibility of red/green lights means management can easily oversee performance. Many modern electronic scales have the capability to send outputs to lights or buzzers although a lot of users may not realise this functionality exists. It’s certainly worth checking with your local scale supplier/manufacturer. At several large Strawberry farms/packing sheds in recent months, a lot of “kitchen scales” have been replaced with packing scales that incorporate this type of target signal technology, historically limited to more sophisticated & costly models.